Blue Susan makes: One more Superhero party...and a couple of favor ideas. One more Superhero party...and a couple of favor ideas. A few months ago we threw our 3rd Superhero Training Academy Birthday party. Our littlest man turned 5 and he wanted a party just like his big brothers. This party is so much fun I didn't mind hosting it again. Though it is a bit of work to throw a party at your house, I kind of think they are the most fun. We mixed things up a bit and I thought I'd share the few things we did differently this time around. The Hulk decided to be Batman at the last minute so we had to rig a costume the morning of. Thankfully we had the cape in the costume box and the t-shirt the drawer. I added some yellow felt to a spy belt and we found some gray pajama pants. I love a quick costume! And of course batman needed a bat symbol cake too. This was our third time making fake weights. I couldn't find thick styrofoam so I cut a bunch of circles from 1 inch styrofoam and glued them together before painting. Boy do I wish I had thrown the first, and most awesome set, into the attic years ago. I saved this set just in case any local friends are in need of a set of fake weights. For punching practice one year we had them punch the Pow Pillows, this time we had each kid put on Hulk fists and punch through a series of balloons that were tied at their level. We also had them practice their aim by throwing footballs through the tire swing. I received an email asking for ideas of something to sew as a favor instead of capes. Here are a couple of simple things I've made to give. One year I cut out masks out of craft foam and sewed a strip of elastic to them. They hold up well and are fun to wear. One year we even gave them at the beginning of the party for those who needed to assume a secret identity. This year I sewed the favor bags. They are easy enough to make by sewing around the sides of two rectangles and hemming the top. To thread in a length of yarn I just unpicked one of the side seams. We stuffed them with a bouncy ball, fruit snacks, lollipops and "Kryptonite" putty. After the party my kids use these little bags to store rock collections, and other little things or to tote just few cars church. 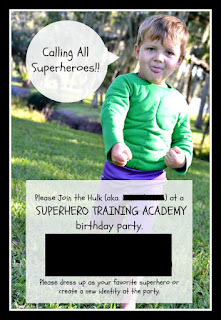 Hopes this helps give you a few more ideas to choose from if you happen to be planning your own superhero party. Good luck!